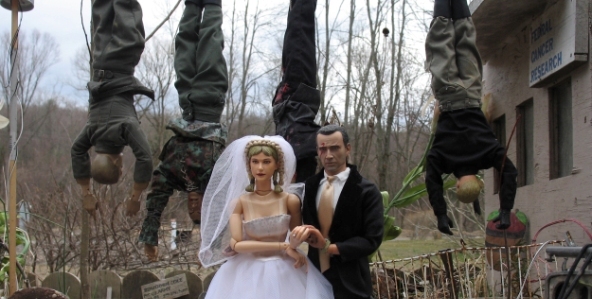 Marwencol is utterly compelling. At some level I want to just leave it at that and tell you to do whatever you can to see this documentary (a schedule of cities and theaters where it is playing in limited release can be seen on the film’s website.) But the film is so rich and so complex I can’t just leave a one line tribute to such a fascinating and unforgettable experience. Filmmaker Jeff Malmberg and his crew hit pay dirt when they found Mark Hogancamp, a man who had been badly beaten by a group of young men outside a bar in Kingston New York in 2000. He was in a coma for nine days and suffered brain damage that included a complete loss of memory and identity. When Hogancamp’s medical coverage ran out, he had to find his own way of recovering his life. The approach he came up with is remarkable and unforgettable at so many levels—the politics and complexities of identity, the nature of art making, the power of storytelling, the permutations of therapy, the sociological/demographic determinates in life, the elemental essentiality of the self. The full story is a complex one, with some unexpected revelations that unfold as the film progresses. There is so much to cherish about this film and the remarkable Mark Hogancamp, but one of the most moving aspects of the telling is how pure the connection is between Hogancamp the man and Hogancamp the maker. He blends these two domains with such an absence of self consciousness, emotional distance or downtown tude that it is almost startling. In the current landscape of media distortion, manipulation and depersonalized fragmentation that flattens what it means to be a human being, this deeply nuanced portrait of a life—that still leaves room for the incomprehensible mysteries as well—is an extraordinary achievement.